A versatile line-up of Gleaner combine fronts is now available from AGCO Australia . Built to last and handle the toughest field conditions, they are reliable and easy to maintain. 3000 Corn Front - This front features extra long polyethylene dividers with a 21.5 degree, low profile entry angle. As a result, gathering is easier and crop loss is minimised. It also has fluted snapping rolls, with six reversible edges and a 16" diameter adjustable auger to ensure smooth delivery to the feedhouse. 5100 draper front - for expansive fields of small grain, there's nothing like the model 5100 draper front to keep things running smoothly and in an orderly fashion. 8200 flex front – This model can also be relied upon for high-capacity harvesting in heavy conditions. 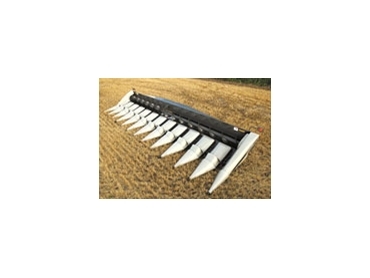 7200 rigid front - From the cutterbar to the auger, the 7200 rigid front is designed to provide a smooth, even flow of crop material to the feedhouse. 4200 Pickup Front – This item is radial pin clutch protected. With the fact that it can be equipped with either a swaathmaster or Rake pickup (windrow) attachment, it provides a direct, even crop flow.